It is hot and humid in Tokyo. A great time to have curry as the spices helps you to sweat, cooling you down. 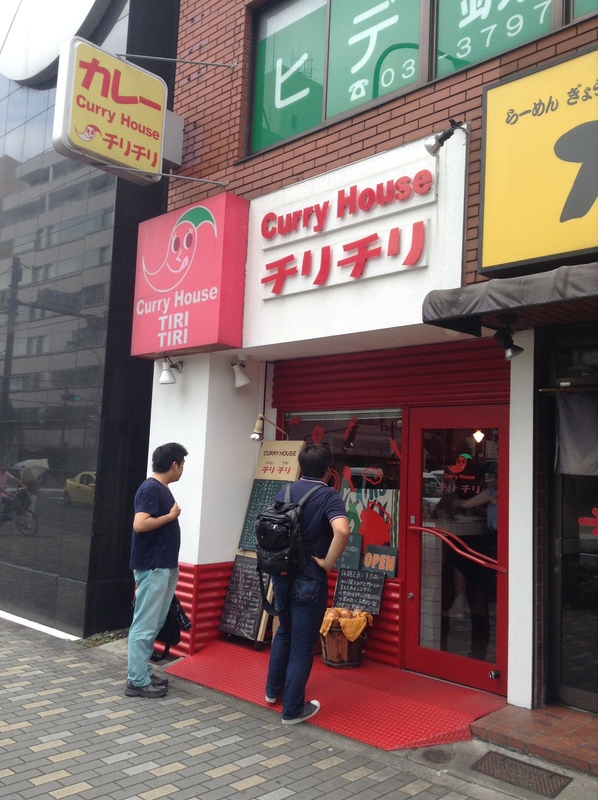 Curry House Tiri Tiri is a popular shop in Shibuya, about a five minute walk from the station along Meiji Dori. While the shop has pork, chicken, or shrimp as options for the curry, I was craving healthful vegetables. This tomato is the chū-kara, medium spicy, curry. If you ask for a small portion of rice you get a 50 JPY discount. The owner’s wife said that a usual serving is a cup and a half of rice so I asked for the small portion, which was perfect. 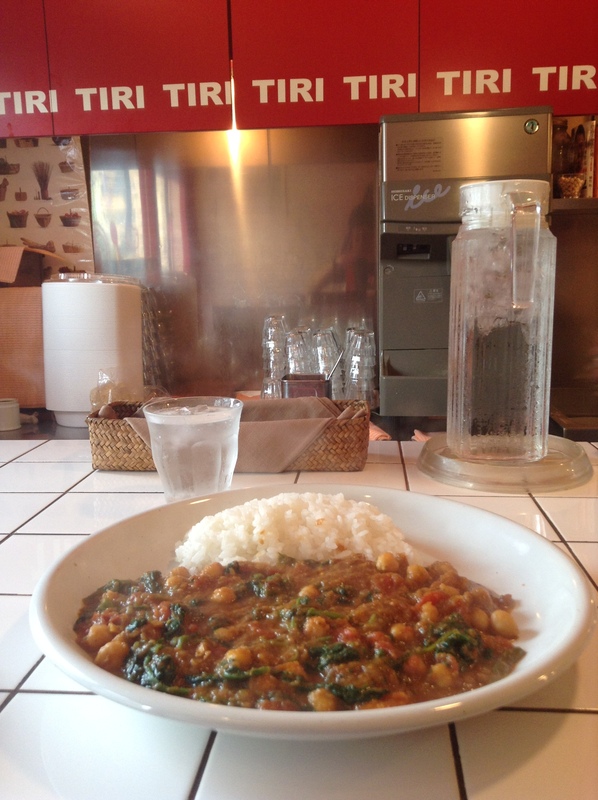 I was curious to come here as the shop is famous for serving healthful curry. The chef uses little oil and lots of onions. Outside of the shop is a sign in Japanese that says each serving of curry contains about one whole onion. All of the ingredients are natural, no preservatives. It is also known for having some of the best curry in the city. The menu is simple. Pick your heat, chū-kara or spicy Masala. You can pick chicken, pork, or shrimp, or go vegetarian. Just list up what you want like tomato, spinach, garbanzo beans, lentils, potatoes, cheese, or a raw egg. Also, tell them if you want a little or a lot of rice. The shop is only open weekdays, 11:30 a.m. – 3:00 p.m., or until they run out. Love this. If I were to do a restaurant I would do the same. Even when I got there around 1 p.m., late for lunch in Japan, there was a line. There are 15 seats at a long counter with white tiles. The line does move quickly as the meal is quite fast. If there is a line outside they will come out and take your order to expedite the service. Quite a lot of customers came for take-away. The only thing they have to drink is ice water. Smart. I don’t know if they speak English. The wife was very abrupt asking me in Japanese if I spoke Japanese. I don’t know how she would be with a non-Japanese speaker. So go prepared. I felt like I was at Seinfeld’s Soup Nazi. Sounds great! Thanks for sharing your experience.